Pure, Gluten-Free Phytoceramides from Pro-Bio Labs could be the secret to beautiful skin people have been looking for! Phytoceramides are a dietary supplement that will help to restore the skin’s natural ceramides. Ceramides are how skin retains its moisture under the onslaught of constant evaporation. In other words, they help maintain beautiful young-looking skin. Pure, Gluten-free Phytoceramides from Pro-Bio Labs help to restore the body’s natural ceramides that naturally decrease as people age. Ceramides are a natural component of skin. The outermost layer of skin, referred to as the stratum corneum serves as a natural barrier that protects underlying skin tissue from infection, dehydration, environmental pollutants and the stress of everyday life. Ceramides, along with cholesterol and other fatty acids, are a major component of the stratum corneum that forms a water-impermeable layer to help seal in moisture, resulting in full, smooth, wrinkle-free skin. Phytoceramides are a source of natural ceramides available in plants that, added as a component of a healthy diet, help to replace the body’s natural ceramides that naturally decrease with age. 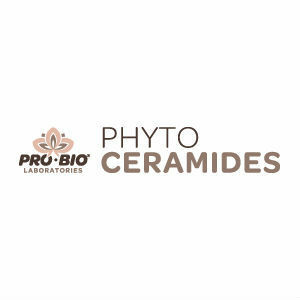 Pro-Bio Labs has been able to isolate plant-based ceramides — known as Phytoceramides — naturally occurring in rice. Other Phytoceramides on the market are isolated from wheat, introducing gluten into product supplements. Phytoceramides by Pro-Bio is gluten free. The manufacturer in the product source provides only very limited information about product content beyond the fact that their product contains plant based ceramides. The product source contained no information about daily product dosage. A product capsule container contains 30 capsules which may be enough for 1 month but the product source does not provide any confirmation of this. $19.95 for a 30 capsule container. Product discounts are available for large orders. The product source contained no information about product guarantees, warranties or product returns. The product source contains no manufacturer’s address or customer service phone number and, in fact, provides no way to contact the manufacturer. The product web site contained the following message – “This is a demo store for testing purposes — no orders shall be fulfilled.” No additional information is provided about ordering the product other than from the web site which apparently is not yet operational. Given the limited information about the product provided in the product source combined with the fact that on line web ordering is not yet available there is not much of a basis left to recommend this product. Ingredient information is missing, guarantee and return policy information is missing as is suggested product dosages and no way is provided to contact the manufacturer to supply this information. Any one interested in this product or purchasing a similar product should for the time being look at other sources. Jack Webster	reviewed Pro-Bio Labs	on February 4th	 and gave it a rating of 2.